A student asked me last week if I could explain the difference between time dilation in Special Relativity (SR) and that in General Relativity (GR), so here is my attempt at doing so. Time dilation in SR comes about when something travels near the speed of light, and is due to the Lorentz transformations which ensure that experiments in any inertial frame are indistinguishable from each other. I have already derived the Lorentz Transformations from first principles in this blog, and these equations are at the heart of SR, and show why time dilation occurs when one travels near the speed of light. In this blog here, I worked through some examples of time dilation in SR. But, what about time dilation in GR? How does time dilation come about in GR? As I have already explained in this blog here, Einstein’s principle of equivalence tells us that whatever is true for acceleration is true for a gravitational field. So, to see how gravity affects time the easiest way is to consider how time would be affected in an accelerating rocket. We will consider a rocket in empty space, away from any gravitational fields, which is accelerating with an acceleration . We will have two people in the rocket, Alice and Bob. Alice is at the top end of the rocket, the nose end. Bob is at the bottom end of the rocket, where the tail is. Alice sends two pulses of light, one at time , and the second one at a time later. 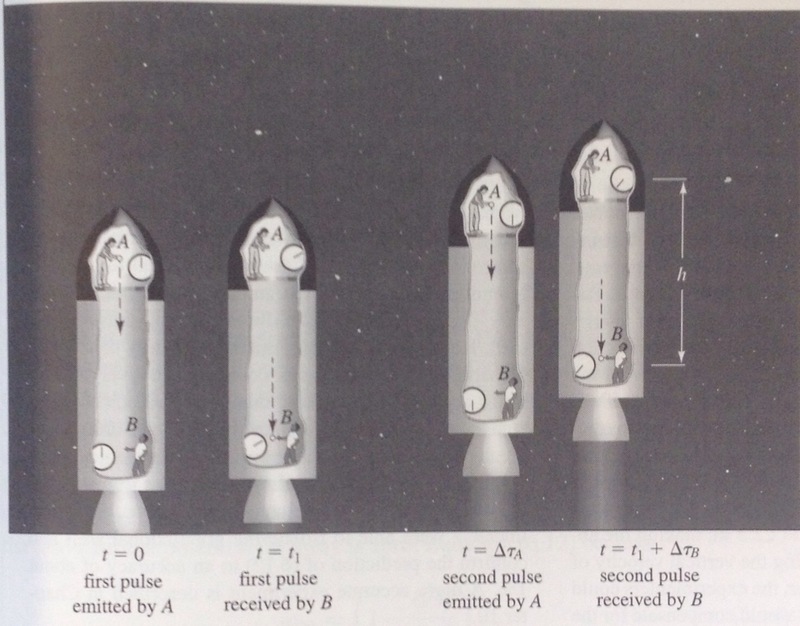 They are received at the back of the rocket by Bob; the first pulse is received when the time is , and the second one when the time is , where is the time interval between flashes as measured by Bob. We can see how time dilation comes about in GR by considering a rocket accelerating in empty space with an acceleration , and a light flashing from Alice at the front-end of the rocket and being received at the back-end by Bob. (this just comes from Newton’s 2nd equation of motion , see my blog here which derives those equations). We will assume that the first pulse takes a time of to travel from Alice to Bob. The second pulse is emitted by Alice at a time after the first pulse, this is the time interval between each light pulse that Alice sends. This second pulse is received by Bob at a time of , where is the time interval between pulses as measured by Bob using a clock next to him. We can use Equations (1) and (2), which give expressions for as a function of , to put in the values that would have when for and for respectively. Because is always positive, this means that is always less than , or to put it another way the time interval as measured by Bob at the back-end of the rocket will always be less than the time interval measured by Alice where the light pulses were sent. This means that Bob will measure time to be going at a slower rate than Alice, Bob’s time will be dilated compared to Alice. From the principle of equivalence, whatever is true for acceleration is true for gravity, so if we now imagine the rocket stationary on the Earth’s surface, with the top end in a weaker gravitational field than the bottom end, we can see that a gravitational field will also lead to pulses arriving at Bob being measured closer together than where they were emitted by Alice. So, gravity slows clocks down! A very important difference between time dilation in SR and time dilation in GR is that the time dilation in GR is not symmetrical. In SR, both observers in their respective inertial frames think it is the other person’s clock which is running slow. In GR, both Alice and Bob will agree that it is Bob’s clock which is running slower than Alice’s clock. In a future blog I will do some calculations on this effect in different situations, but as you can see from Equation (8), the size of the dilation depends on the acceleration and the difference in height between . I will also discuss whether it is time dilation due to GR or time dilation due to SR which affect the satellites which give us GPS the more, as both effects have to be taken into account to get the accuracy we seek in the GPS position. I found it fun to derive all of the SR equations, thus including the Lorentz Transformation equations, by simply mentally analyzing “Motion”. In short, I had to do it this way since my parents pulled me out of school before I had a chance to receive any education in the field of physics. Accuracy of atomic clock or optical lattice clock is written to be one second per 30 million years or per 30 billion years, etc. Effect of the gravity is not stated. On the other hand, on an atomic clock loaded on GPS, effect of gravity is said to be evident (with specific value : per a day). Are the two compatible ?